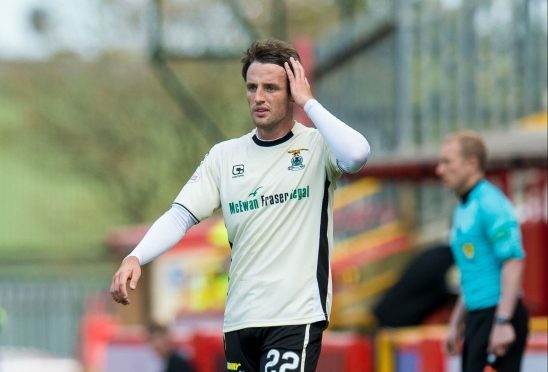 Brad McKay will return for Inverness' game against Hamilton. Caley Thistle defender Brad McKay will return for tomorrow’s crucial Premiership match against Hamilton Accies, but right back David Raven is set for a six-week injury lay-off. McKay has been sidelined since suffering an ankle injury in a challenge from Aberdeen defender Graeme Shinnie in last month’s 3-1 defeat against the Dons at Caledonian Stadium. The former St Johnstone defender has returned to training this week with his return likely to be accelerated by a lack of defensive options for tomorrow’s visit of Accies. Raven is among the absentees with a knee injury suffered in training last week, just days after returning from a spell out with concussion, with the Englishman now ruled out after until the turn of the year. With Gary Warren suspended and Kevin McNaughton out long-term with an Achilles injury, McKay is likely to be pitched straight back into the team. Manager Richie Foran said: “Brad tried to test his injury last week for the good of the team, a little bit against the physio’s say-so, and it didn’t work. He’s tried it again and he’s looking good. “He’s a little bit sore, and there’s a bit of swelling, but he can get through it. He’s strong and credit to him for that. “David Raven will probably be out for six weeks with the strain on his knee which is very disappointing for us and him. Defensive problems have been at the centre of Foran’s concerns in recent weeks, with Caley Jags conceding the highest number of goals of any Premiership side, 32. Foran is frustrated by the constant loss of goals but takes his share of the blame for Inverness’ recent poor form, with the Highlanders bottom of the table having lost their last four games. He added: “I’m not happy. I’m disappointed in myself. I feel as if I’m letting people down. I feel as if I’m letting the club down. But it will come. As I’ve said before, we have some really talented attacking players. “Defensively, the players are just not there at the moment. We need to work harder defensively off the ball, spotting the danger quicker and snuffing it out. We need to get better at that to stop the goals going in. “There are tweaks we’ve tried, but we still need to get ourselves on the attack, creating chances and scoring goals. “Individual mistakes have cost us a lot as well. A lot of the goals are coming through the middle which is disappointing. We need the spine of our team to be strong and it has been for years.